McCain's assets amount to roughly 36 Million Dollars. 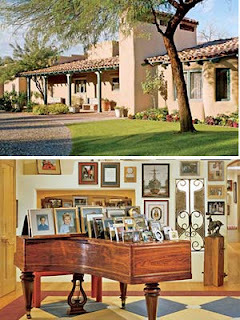 If just one word could be used to describe John and Cindy McCain's home in Hidden Valley, Arizona, that word would be comfortable. "We wanted nothing more than this place to be comfortable for everybody that walks into it," says Cindy. Here, away from the hustle and bustle of Washington, the McCains and their four children live nestled among the low desert hills and fruit trees, the biggest decision being what to throw on the barbecue for supper. So why Arizona? As a Navy pilot in the Vietnam War, McCain was shot down in 1967 in a bombing mission over Hanoi and managed to survive five and half years in a North Vietnamese prison camp. He finally returned home in 1973 and while serving in a post -war position as liaison between the U.S. Navy and the U.S. Senate, Captain John McCain met Arizona native Cindy Hensley. McCain's first marriage, to Carol Shepp, had ended in divorce, and John and Cindy were eventually married in 1980. It wasn't long before Cindy expressed a desire to "go home" to Arizona. View more photos after the jump. This high-ceilinged room is the senator's favorite, with its Arizona flagstone floor and fireplace. The table in front of the sofa is made from a shutter from a Mexican church. Cindy creatively uses the children's artwork to decorate. "I would rather look at their art than somebody else's, and I'm proud of what they've done," she says. Cindy loves the easy look of Americana pieces, shown here in the living room of the main house. The decor in the master suite "just happened," says Cindy. "There are just things in this room that I like, and that's really what it's all about." Barbecuing is one way that John McCain loves to kick back at his home. Cooking is a favorite hobby of the senator's, and when he steps up to the grill , it's time for everyone else to step back. Here is his best tip for cooking all manner of meats on the grill (chicken, tenderloin, burgers, ribs, etc. ): "The slower they 're cooked, the better they're going to be and the more impurities you can get out of them." And this: "Lemon does great things for anything that's cooked on the grill !" I have stayed in Dubai for 2 years and the place is fantastic, it is really growing as a premium business center of Asia and in the coming days Dubai has a bright future.